Usually I’m a chocolate chip cookie kind of girl. I love the classic with crisp edges and a chewy interior. Nothing fancy and that’s what I like about them. But this time of year, steroids I feel the need to venture out of my comfort zone. I start to crave Pumpkin Chocolate Chip Cookies and other confectionary scented with ginger and cinnamon and cloves. These Molasses Cookies are just what I’m looking for. They taste of Fall and burning leaves and upcoming holidays. I can close my eyes and almost imagine that it’s not 80 degrees outside. They’re spicy and simple. Crisp around the edges and chewy in the middle. The perfect fall cookie. Preheat oven to 375Â°. Line 2 cookie sheets with parchment paper and set aside. In a stand mixer fitted with the paddle attachment, cream the butter and sugar. If you don’t have a mixer, just whisk thoroughly. Add the molasses, egg, and milk and stir until well combined. Sift together flour, cloves, ginger, cinnamon, salt, and baking soda. Add dry mixture to molasses mixture 1/2 cup at a time, mixing well after each addition. Drop by tablespoons onto cookie sheets and bake for 11 minutes. Let cool completely before eating. You! Definitely try these. Bet they would be good with lemon curd! these cookies look perfectly round and delicious! love the warm spices! 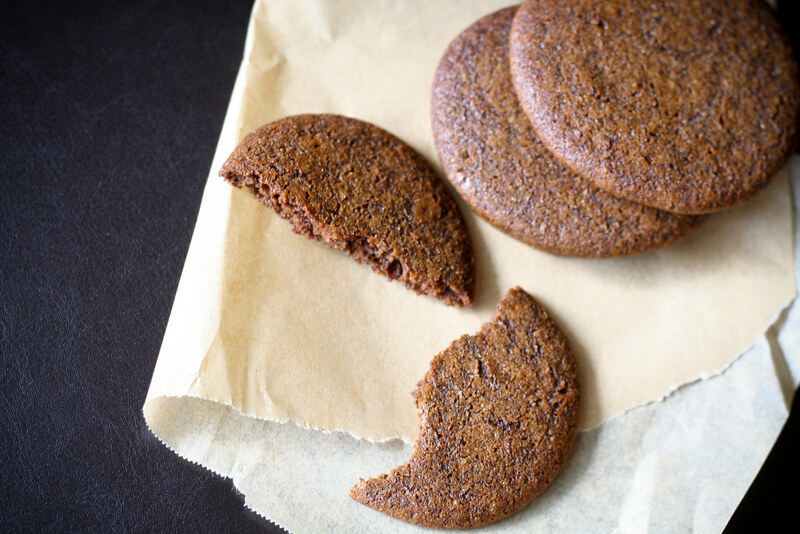 I love the idea of a molasses cookie that is chewy on the inside. I find all too often the fall/winter spice cookies wind up too hard and crunchy. I was thinking about including a cookie in my Thanksgiving spread and I think I may be using this recipe. Thanks! 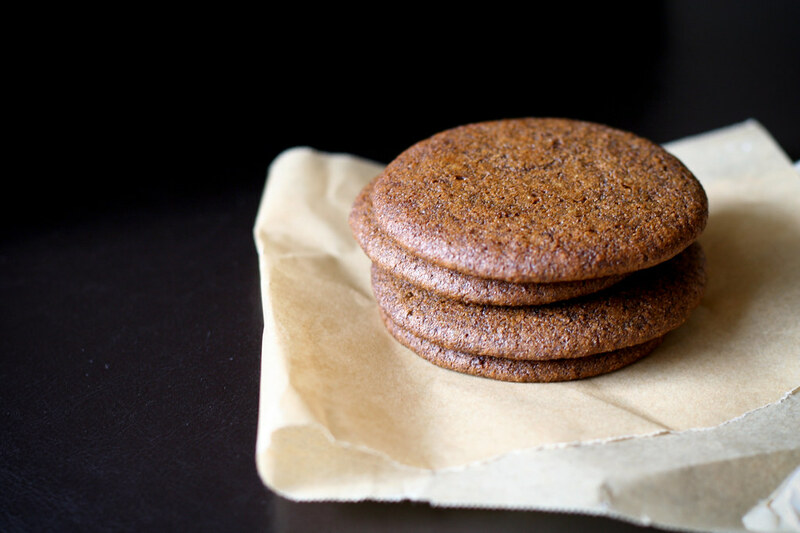 my donkeys love any molasses cookies and I’ll try this recipe and see how it measures up with them. Thanks! Thanks Mel! These look divine and it’s fall where I live in WV (about an hour north of D.C.) and it’s cold, the leaves are red and orange…and you can smell the firewood burning and sometimes leaves as well…so thank you. I will makes these for my daughter! These look so yummy. Chewy on the inside sounds perfect to me. i’m in the appalachians in western maryland with nice crunchy leaves and cool, crisp air. totally making these this weekend. bet they’d go so nicely with a steaming cup of spiced cider. yum! Those cookies look awesome! I have to try them! Thanks. I have been looking for a recipe just like this to add to my Christmas baking repertoire! My son is coming home from college this Christmas so I want to make things extra special – these look like a delicious start. Yes, healthy cookies! Also, for anyone interested, cinnamon helps to lower blood sugar, and ginger is good for digestion. I love molasses cookies. I used to bake a more cake-textured molasses cookie every year when the weather really, truly turned – called it my “autumn cookie.” This year I’ll try your recipe, because those cookies are making my mouth water!! Okay, I just tried this recipe, and while the cookies are tasty, they turned out cakey and puffy, not crispy at all. The dough seemed pretty wet and cake- batter- like, I expected it to be stiffer. Any ideas what happened? I’ve been thinking about making some good, spicy cookies for fall. I had Gingerbread cookies in mind. But these look really good, too. Same here Kerry! My cookies turned out like little nuggets of cake. They were delish, but looked nothing like the photo! I made them, and they tasted great, but for some reason they all melted together on the pan. I had to use a pizza cutter to cut them apart. They almost turned out like lace cookies. Kerry & Beata – That’s weird. Maybe cook them for an extra 2 or 3 minutes? It’s still warm down here so my oven was quite hot. The batter is actually pretty liquidy. That’s why mine are so round. A little unwieldy, but they cook up nicely. Rett – Oops. I guess I should have mentioned that they should be spaced far apart because they spread a lot in the oven. Cloves, ginger, cinnamon…they all sound so perfect this time of year. There’s just nothing like those scents filling your kitchen – not even the scent of chocolate chip cookies! I really want to try these – thank you! I had the same problem as Kerry, Beata, and Rett. I couldn’t decide if the milk amount was off, if I needed to make the cookies *way* smaller and then bake them longer or if it was something else entirely. Thanks for the great recipe, they turned out delicious and totally bitchin’. They will be part of my Christmas cookie selection for sure. These were exactly the cookies I was looking for. Thank you. I got more than 2 dozen though. After the first 2 pans I decided I wanted them about the size of a vanilla wafer so that I could serve them with pumpkin dip. So far, my little guinea pigs at work have decided they are a big hit. Thanks again- they are perfect!! Hi Mel. I am just getting into the baking scene and tried your cookies! I used egg beaters and 2%milk and they came out deelish! thank you! I put them in a glasslock overnight and now they are a bit sticky instead of crispy around the edges now….is there something better I should have kept them in? I am going to post a link to your recipe if that’s okay..I am all new to this blogging thing….hope all is well! Karen – Mine were also sticky the next day. I just reheated them in the oven to re-crisp them. You can also try a toaster or toaster oven, but I haven’t tried those yet. Thanks Mel! Okay..so..not the toaster..they fell apart in mine..toaster oven might work great and i agree warming them up is a good idea for the next day. I might have had a bit too many now :) I did post some pics on my blog so if you have any feedback, please let me know!